Based in Bethesda, Md., Brigid Rauch has been writing about health and nutrition since 2007. Her work has appeared on websites for companies like Honest Tea. Rauch holds a master's degree in urban planning from University of Illinois at Chicago. She is a registered yoga teacher with Yoga Alliance and teaches classes in Ayurvedic holistic medicine for moms and pregnant women. If you have a sore throat due to cough, cold or allergies, a combination of ginger and honey may help relieve your symptoms and may also treat the root cause of your sore throat. The medicinal use of ginger and honey dates back to ancient times. Both are versatile remedies that may help treat a variety of conditions naturally and without side effects. Talk to your doctor before using any herbal remedies; there isn't enough clinical evidence to support claims of ginger and honey's effectiveness against sore throat or other health conditions. According to "The Illustrated Encyclopedia of Healing Remedies" by Norman Shealy, ginger is an analgesic--a pain killer--that may ameliorate the pain associated with a sore throat. It is also antibacterial and antifungal and may help fight the infection causing your sore throat. According to "The Yoga of Herbs" by David Frawley and Vasant Lad, ayurvedic medicine considers ginger to be a universal medicine because it works on all tissues of the body and is sattvic, or balancing--meaning that it brings back balance and health to the body. Clinical evidence to support medicinal use of ginger is inconclusive. Don't use ginger medicinally if you are pregnant. According to "The Honey Prescription" by Nathaniel Altman, honey has been, since ancient times, one of the best known anti-inflammatory agents. It soothes irritation in the skin, mucus membranes and internal organs of the body. Honey also has special infection-fighting enzymes, such as the glucoseoxidase enzyme, which creates antimicrobial hydrogen peroxide. Modern medicine is now rediscovering the value of honey, particularly for aiding rapid recovery from wounds and infections such as in special manuka honey-treated bandages, says "The Honey Prescription." However, the exact enzyme content in honey is not standardized and there is not enough clinical evidence to support using it to heal a sore throat . The properties of ginger and honey make them both excellent medicines to treat the pain and inflammation of a sore throat as well as a variety of possible underlying causes. However they are even more powerful when they are combined. According to "The Yoga of Herbs," using herbal medicines in combination boosts their benefits. This suggests that using honey and ginger together may provide rapid healing action. There is not enough clinical evidence to support the effectiveness of ginger and honey for treating a sore throat. Sipping ginger juice with honey several times a day may help resolve your sore throat, recommends "The Illustrated Encyclopedia of Healing Remedies." Macerate a 3-inch section of fresh ginger root--or run it through a vegetable juicer--and squeeze out the juice. Mix the fresh ginger juice with 3 tablespoons of lemon or lime juice -- lemon and lime add vitamin C and are antimicrobial -- and 3 tablespoons of honey. Sip the mixture whenever you feel irritation in your throat. 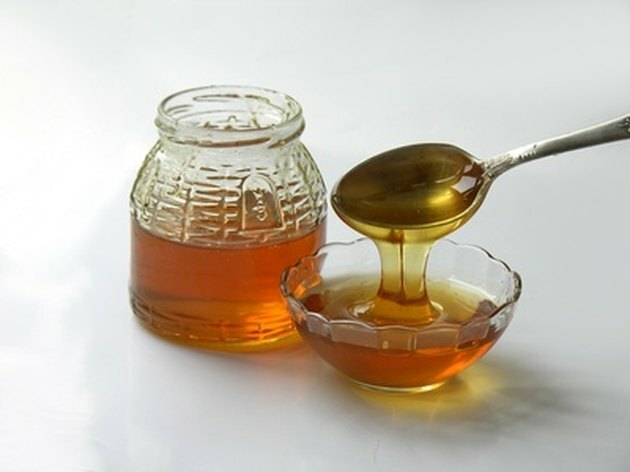 There is not enough clinical evidence to support using honey and ginger for a sore throat. A warm infusion of ginger with honey added may also soothe a sore throat. Bring 6 cups of water to a boil and add four slices of fresh ginger root. Reduce heat and simmer for ten minutes. Let the mixture cool until it is just slightly warmer than body temperature and mix in 2 to 3 tablespoons of honey. Sip the infusion whenever your throat feels sore. There isn't enough clinical evidence to support claims that ginger and honey will heal a sore throat or other health conditions. Agricultural Journals: "Methylglyoxal in Manuka Honey – Correlation with Antibacterial Properties"